A Colorado brewery that created a limited-run beer flavored with bull testicles for a beer festival is making the ballsy move to offer it all year round. 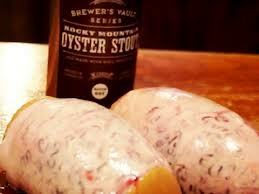 Wynkoop Brewing Company’s Rocky Mountain Oyster Stout will now be sold nationwide in cans–available in (what else?) two-packs starting this month. The Denver-based brewery first served the beer –originally meant as an April Fools’ joke–at the Great American Beer Festival in Denver back in October. Made with 25 lbs of roasted bull gonads, the beer masters said they wanted to showcase a local delicacy –deep-fried bull testicles, also known as Rocky Mountain oysters. People, well, went nuts for it. And soon you’ll be able to try it for yourself.